la elección de los fans: these shoes ? Is he your favorito! Alice in Wonderland character? la elección de los fans: Yes, but he/she dosen't look like Cheshire. Do tu like your Chessur chubby & cuddly,super skinny,or in between? Inspired por the crafty cat that bemuses Alice, this magdalena is all grins — and likely to disappear in the blink of an eye. The Cheshire Cat is a fictional cat popularized por Lewis Carroll's depiction of it in Alice's Adventures in Wonderland. 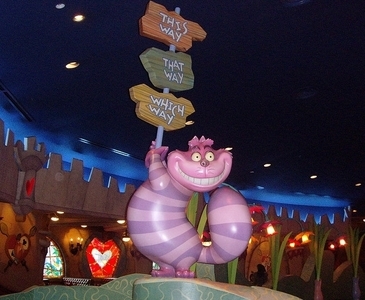 In which Disneyland can tu see this figure of Cheshire Cat?